This article is about the Pale in Imperial Russia. For other places referred to as "pale", see Pale (disambiguation). The Pale of Settlement (Russian: Черта́ осе́длости, chertá osyédlosti, Yiddish: דער תּחום-המושבֿ‎, der tkhum-ha-moyshəv, Hebrew: תְּחוּם הַמּוֹשָב, tẖum hammosháv) was a western region of Imperial Russia with varying borders that existed from 1791 to 1917, in which permanent residency by Jews was allowed and beyond which Jewish residency, permanent or temporary, was mostly forbidden. Most Jews were still excluded from residency in a number of cities within the Pale as well. A limited number of Jews were allowed to live outside the area, including those with university education, the ennobled, members of the most affluent of the merchant guilds and particular artisans, some military personnel and some services associated with them, including their families, and sometimes the servants of these. The archaic English term pale is derived from the Latin word palus, a stake, extended to mean the area enclosed by a fence or boundary. The Pale of Settlement included all of Belarus, Lithuania and Moldova, much of present-day Ukraine, parts of eastern Latvia, eastern Poland, and some parts of western Russia, roughly corresponding to the Kresy macroregion and modern-day western border of Russia. It extended from the eastern pale, or demarcation line, to the Russian border with the Kingdom of Prussia (later the German Empire) and the Austro-Hungarian Empire. Furthermore, it comprised about 20% of the territory of European Russia and largely corresponded to historical lands of the former Polish–Lithuanian Commonwealth, Cossack Hetmanate, and the Ottoman Empire (with Crimean Khanate). The Russian Empire in the period of the existence of the Pale was predominantly Orthodox Christian. The area included in the Pale, with its large Jewish, Uniate and Catholic populations, was acquired through a series of military conquests and diplomatic maneuvers, between 1654 and 1815. While the religious nature of the edicts creating the Pale are clear (conversion to Russian Orthodoxy, the state religion, released individuals from the strictures), historians argue that the motivations for its creation and maintenance were primarily economic and nationalistic in nature. The end of the enforcement and formal demarcation of the Pale coincided with the beginning of the First World War, and ultimately with the February and October Revolutions of 1917, i.e., the fall of the Russian Empire. For more information about life in the Pale, see History of the Jews in Poland and History of the Jews in Russia. The Pale was first created by Catherine the Great in 1791, after several failed attempts by her predecessors, notably the Empress Elizabeth, to remove Jews from Russia entirely,[better source needed] unless they converted to Russian Orthodoxy, the state religion. The institution of the Pale became more significant following the Second Partition of Poland in 1793, since, until then, Russia's Jewish population had been rather limited; the dramatic westward expansion of the Russian Empire through the annexation of Polish-Lithuanian territory substantially increased the Jewish population. At its height, the Pale, including the new Polish and Lithuanian territories, had a Jewish population of over five million, and represented the largest component (40 percent) of the world Jewish population at that time. From 1791 to 1835, and until 1917, there were differing reconfigurations of the boundaries of the Pale, such that certain areas were variously open or shut to Jewish residency, such as the Caucasus. At times, Jews were forbidden to live in agricultural communities, or certain cities, (as in Kiev, Sevastopol and Yalta), and were forced to move to small provincial towns, thus fostering the rise of the shtetls. Jewish merchants of the First Guild (купцы первой гильдии, the wealthiest sosloviye of merchants in the Russian Empire), people with higher or special education, University students, artisans, army tailors, ennobled Jews, soldiers (drafted in accordance with the Recruit Charter of 1810), and their families had the right to live outside the Pale of Settlement. [better source needed] In some periods, special dispensations were given for Jews to live in the major imperial cities, but these were tenuous, and several thousand Jews were expelled to the Pale from Saint Petersburg and Moscow as late as 1891. During World War I, the Pale lost its rigid hold on the Jewish population when large numbers of Jews fled into the Russian interior to escape the invading German army. On March 20 (April 2 N.S. ), 1917, the Pale was abolished by the Provisional Government decree, On abolition of confessional and national restrictions (Russian: Об отмене вероисповедных и национальных ограничений). 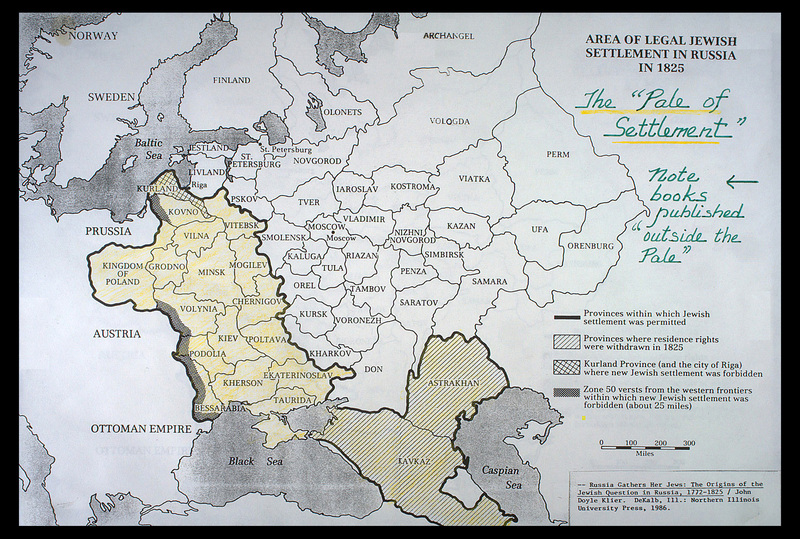 A large portion of the Pale, together with its Jewish population, became part of Poland. Subsequently, most of this population would perish in The Holocaust one generation later. Geographic distribution of Jewish languages (such as Yiddish) in the Russian Empire according to 1897 census. The Pale of Settlement can be seen in the west, top left. Jewish life in the shtetls (Yiddish: שטעטלעך‎ shtetlekh "little towns") of the Pale of Settlement was hard and poverty-stricken. Following the Jewish religious tradition of tzedakah (charity), a sophisticated system of volunteer Jewish social welfare organizations developed to meet the needs of the population. Various organizations supplied clothes to poor students, provided kosher food to Jewish soldiers conscripted into the Tsar's army, dispensed free medical treatment for the poor, offered dowries and household gifts to destitute brides, and arranged for technical education for orphans. According to historian Martin Gilbert's Atlas of Jewish History, no province in the Pale had less than 14% of Jews on relief; Lithuanian and Ukrainian Jews supported as much as 22% of their poor populations. The concentration of Jews in the Pale, coupled with Tzar Alexander III's "fierce hatred of the Jews", and the rumors that Jews had been involved in the assassination of his father Tzar Alexander II made them easy targets for pogroms and anti-Jewish riots by the majority population. These, along with the repressive May Laws, often devastated whole communities. Though attacks occurred throughout the existence of the Pale, particularly devastating anti-Jewish pogroms occurred from 1881–83 and from 1903–1906, targeting hundreds of communities, assaulting thousands of Jews, and causing considerable property damage. One outgrowth of the concentration of Jews in a circumscribed area was the development of the modern yeshiva system. Until the beginning of the 19th century, each town supported its own advanced students who learned in the local synagogue with the rabbinical head of the community. Each student would eat his meals in a different home each day, a system known as essen teg ("eating days"). After 1886, the Jewish quota was applied to education, with the percentage of Jewish students limited to no more than 10% within the Pale, 5% outside the Pale and 3% in the capitals of Moscow, St. Petersburg, and Kiev. The quotas in the capitals, however, were increased slightly in 1908 and 1915. Amidst the difficult conditions in which the Jewish population lived and worked, the courts of Hasidic dynasties flourished in the Pale. Thousands of followers of rebbes such as the Gerrer Rebbe Yehudah Aryeh Leib Alter (known as the Sfas Emes), the Chernobyler Rebbe, and the Vizhnitzer Rebbe flocked to their towns for the Jewish holidays and followed their rebbes' minhagim (Jewish practices) in their own homes. The tribulations of Jewish life in the Pale of Settlement were immortalized in the writings of Yiddish authors such as humorist Sholom Aleichem, whose novel Tevye der Milchiger (Tevye the Milkman) (in the form of the narration of Tevye from a fictional shtetl of Anatevka to the author) form the basis of the theatrical (and subsequent film) production Fiddler on the Roof. Because of the harsh conditions of day-to-day life in the Pale, some two million Jews emigrated from there between 1881 and 1914, mainly to the United States. ^ "pale, n.1." OED Online. Oxford University Press, September 2016. Retrieved October 24, 2016. The Pale was the part of medieval Ireland controlled by the English government. ^ "Shtetl". Encyclopaedia Judaica. Jewish Virtual Library, The Gale Group. ^ Rabbi Ken Spiro. "History Crash Course #56: Pale of Settlement". aish.com. Retrieved 19 August 2015. ^ Montifiore, Simon Sebag. The Romanovs -- 1613 to 1918. pp. 463–464. ^ "Modern Jewish History: Pogroms". Encyclopaedia Judaica. Jewish Virtual Library, The Gale Group. 2008. Retrieved 19 August 2015. ^ Первая всеобщая перепись населения Российской Империи 1897 г.: Распределение населения по вероисповеданиям и регионам [The first general census of the population of the Russian Empire in 1897: Population by religions and regions]. Демоскоп Weekly (in Russian). Retrieved 30 September 2013. Abramson, Henry, "Jewish Representation in the Independent Ukrainian Governments of 1917–1920", Slavic Review, Vol. 50, No. 3 (Autumn 1991), pp. 542–550.